NEW series of motor ready linear positioning stages feature ALM MADE IN USA, Precision Crossed Roller Linear Bearings. ALM Crossed Roller stages are characterized by smooth, quiet, repeatable, frictionless motion while providing flatness and straightline accuracy of 2 micron / 25mm travel. Torsional stiffness and rigidity, zero sideplay in any attitude and minimal torque requirements make these stages the designers choice for high precision linear positioning applications. Long life and maintenance free operation make these stages ideal for cleanroom or difficult access locations. ALM stages are available in aluminum or cast iron (stainless steel optional), with ballscrews or leadscrews, and include english mounting holes (metric optional), single piece NEMA frame motor mounts, and aluminum flexible coupling as standard. ALM features the widest selection of accuracy grades, motor mounts, materials, waycovers, finishes, limit switches and feedback options available, many directly from stock. 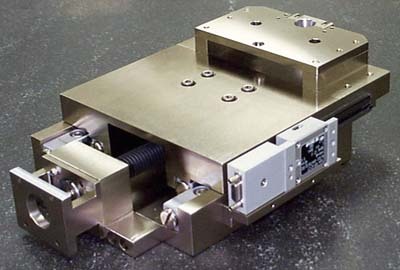 ALM stages can be supplied with custom mounting provisions, in multi-axis configurations, with laser calibration certification, vacuum preparation, or clean room certified. Cant find a suitable standard product? ALM welcomes application specific stage design and fabrication projects.